When it comes to opinions, those regarding China by Westerners seldom rise to superlative. From child labor sweatshops to cheap plastic trinkets to shoddily constructed knockoffs to IP piracy, the average take is commonly one of polluted cities and human rights abuses. Apple’s iPhones aside. 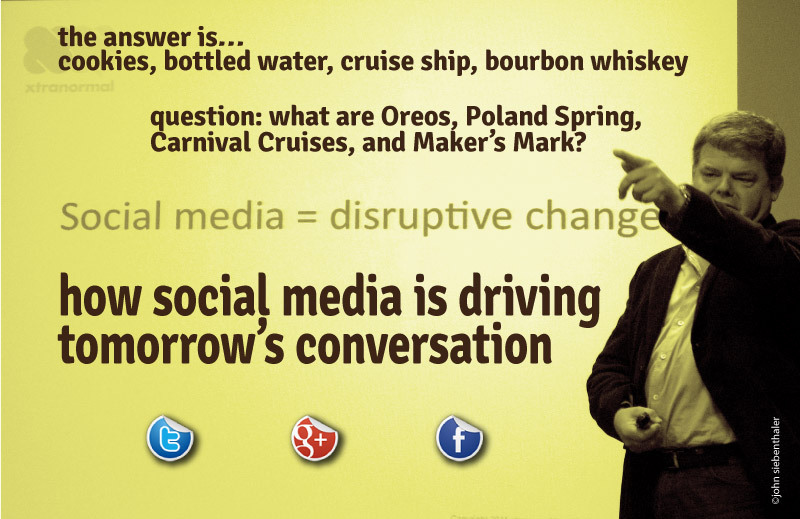 SapientNitro Global Marketing Strategy VP Freddy Laker tackles the existing memes with a compelling view of an alternate digital universe that’s on track to provide over half of all online content by 2015. More revealing is his take on the web landscape trod by Chinese, with same as, yet different, versions of familiar check-ins like facebook, Groupon, twitter, etc. Does the electronic firewall separating the PRC from our digital daily life matter? Apparently not, as the Chinese entrepreneurial spirit has spawned look-alikes in a stunning variety of flavors, all without missing a beat. 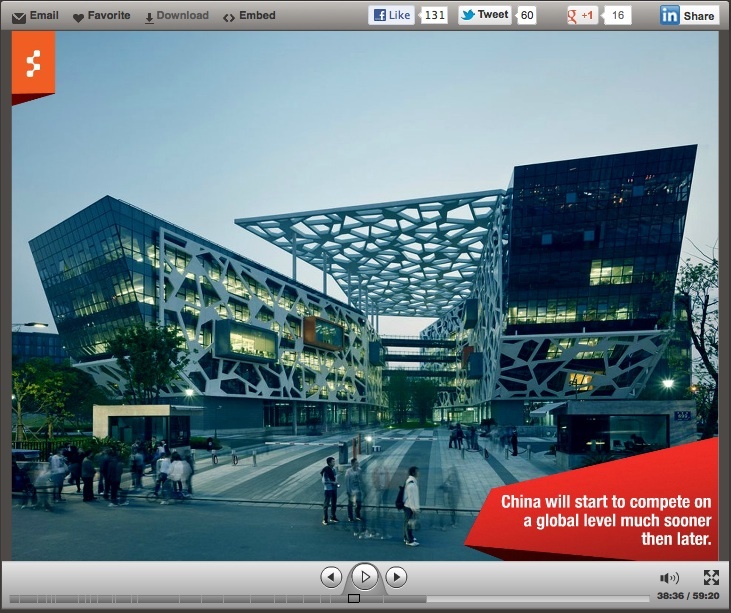 This slideshare adaptation of a 2012 SWSWi preso “China – Will It Redefine Our Digital Landscape?” is a half-hour peek into a world I didn’t imagine existed. Bonus footage: Laker’s unique strategy for assimilation into China’s culture. Hint: TMZ meets ET, hatches HuffPo hybrid. 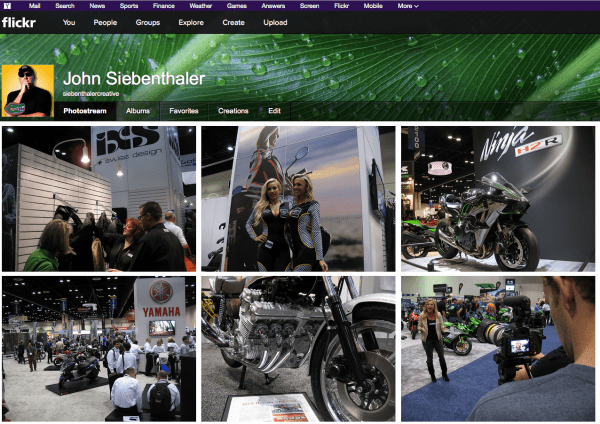 This entry was posted in digital media, web and tech and tagged china, digital, internet, marketing, slideshare, web on May 10, 2012 by John Siebenthaler. 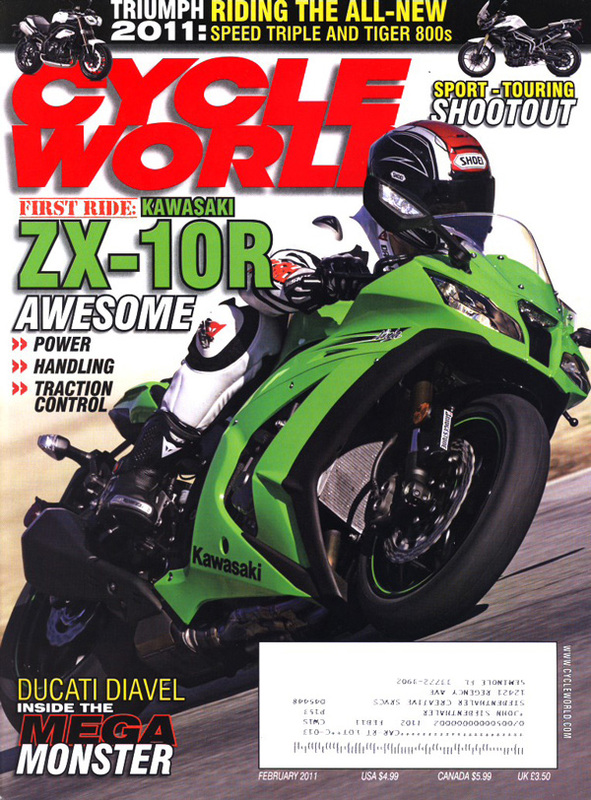 Next to “What came first?” the most difficult question asked by non-riders is what’s it like to ride a motorcycle. It’s a question that’s given rise to countless variations of the same t-shirt, all to the point that if you have to ask you’ll never understand. Which brings me to this wonderfully expressive short by motojournalism. Two guys, reflecting on a lifetime of deep friendship and mutual respect, made possible by a jointly shared love of offroad riding. I’m still not sure if it explains what riding’s like to someone who doesn’t. But it sure worked to raise my pulse a couple of notches. 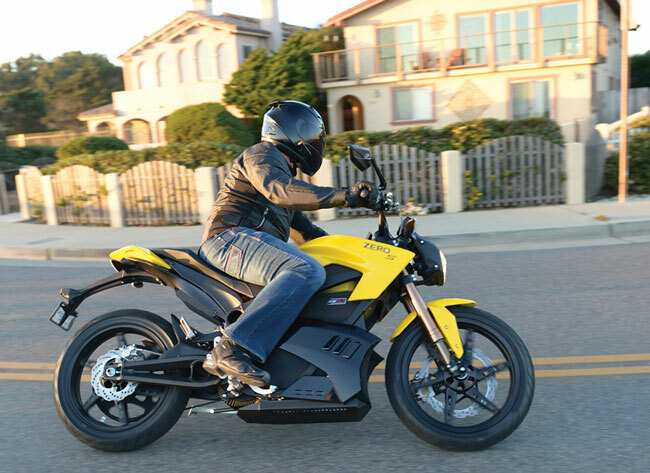 This entry was posted in web and tech and tagged husqvarna, motorcycle, offroad on April 17, 2012 by John Siebenthaler. Just noticed YouTube’s updated favicon. Cleaner? Yes. Better? No. Favicons are one of the web’s finest tiny treasures, used to impart individuality and brand identity at the most basic browser URL address level. It’s a mini-logo that IDs the site as original and authentic. The process of favicon creation is a definite art, not just the result of taking a logo or trademark and shrinking it down to a 16 x 16 pixel square. Roughly comparable to building a sailboat in a bottle, the successful digitalization of a mark is done at the pixel level; the harsh limitations of bitmap art that will eventually live as a rasterized facsimile. In the case of YT, it’s pretty obvious that Google is in the process of homoginizing their various properties. I never thought the original YT worked, but it was identifiable. The new favicon is simply a reskinned play button that, while cleaner, doesn’t communicate anything unique. This entry was posted in brand management, graphic design, web and tech and tagged design, favicon, google, youtube on January 7, 2012 by John Siebenthaler. the end of end-to-end online print? Khol Vinh is a designer. Not that unusual, but his previous job as design director for nytimes.com makes him unique and his skillful accomplishments considerable. In a short, insightful interview on digiday, he challeges the cultural tradition that starts on C1 and proceeds to C4, digital pages turning at regular intervals like scheduled stops on a train trip. Read more of Mr. Vinh’s insight into digital magazine publishing here. Originally sourced in a posting at Poynter. 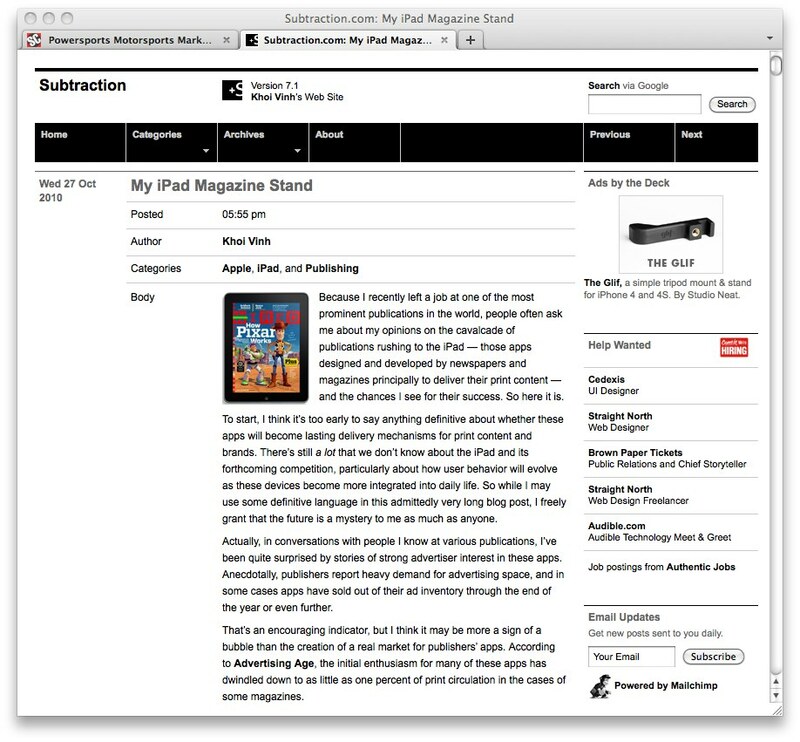 This entry was posted in digital media, graphic design, marketing and promotion, web and tech and tagged apps, design, ezines, new york times, nytimes on October 25, 2011 by John Siebenthaler. The photograph above is one of the first real time, commercial digital images ever viewed on the internet. Today we snap anecdotal photos by the billions, using miniaturized smart phone cameras to simultaneously update our visual interests to any number of social sites. It wasn’t always this painless. This is what it looked like in the beginning. At the same time while what we now know as the web and its browser viewed rich content was still being imagined, the internet of the early years ran over household telephone lines behind an impenetrable wall of individual cantons. I belonged to CompuServe, the first and then largest of a half-dozen or so commercial intranet services (AOL, Prodigy, GEnie, each serving their own customer base and incapable of talking to each other) popular at the time. Members jumped online with dialup modems that connected to local access nodes peppered throughout the continent. Common practice when traveling was to tote along a phone jack hack kit and a list of hit-or-miss toll-free numbers. There was no in-camera preview; the image first had to be transferred (over SCSI cables) to a Mac IIsi for viewing in Photoshop and downsampling before being uploaded to Compuserve’s mainframe in Columbus, Ohio, a process which took nearly half an hour over a staggeringly slow 2,400-bps modem. 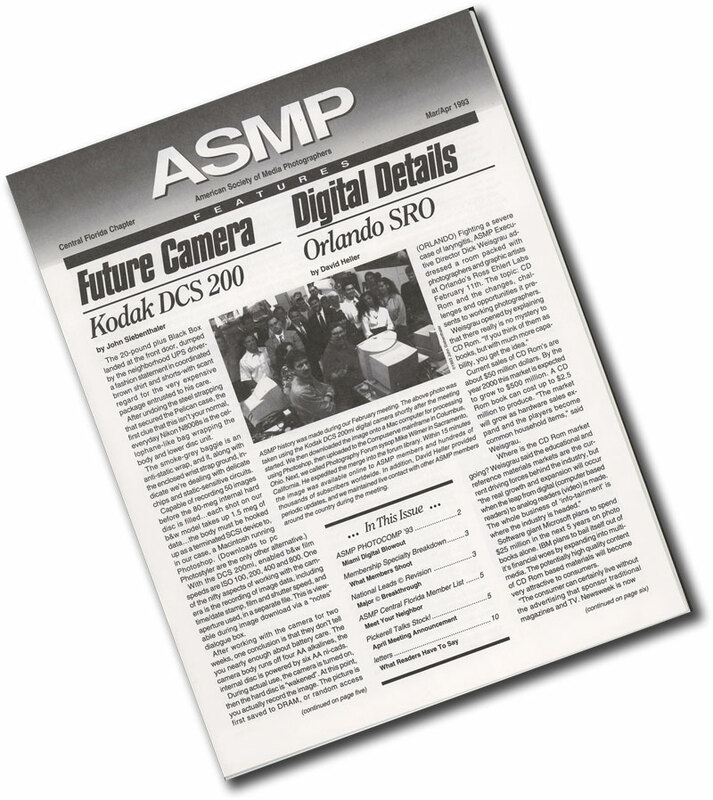 To complete the project, Compuserve’s Photography forum owner in Sacramento had to merge the image into the forum library, and within 15 minutes it was available for viewing and download by ASMP members worldwide. As part of the experiment, ASMP members in three separate chapters throughout the country were also able to conduct live online chats within the forum. 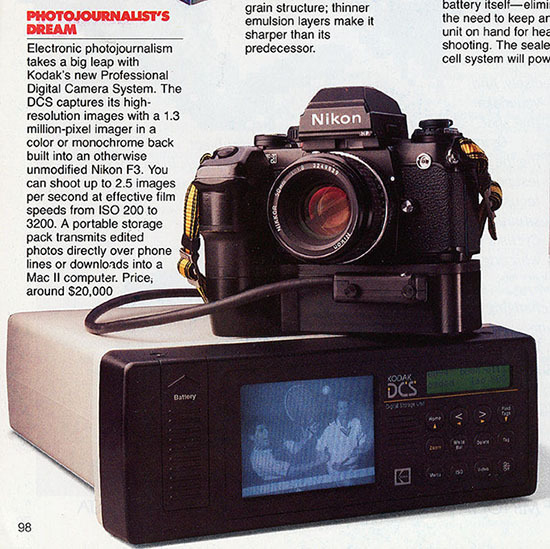 The photograph above is one of the first near real time, commercial digital images ever viewed on the internet. This entry was posted in digital media, web and tech and tagged asmp, compuserve, digital photography, internet on September 23, 2011 by John Siebenthaler.